More than $20 billion fees are taken yearly by banks and change offices from expats, students and migrants who need to transfer money. These $20 billion are what Moneytis wants to help saving. In facts this is already possible but complicated: we have to compare all solutions, understand real fees including hidden ones, and trust new companies Moneytis is a platform which, as booking.com does with hotels, compares money transfer solutions in real time and integrate them. 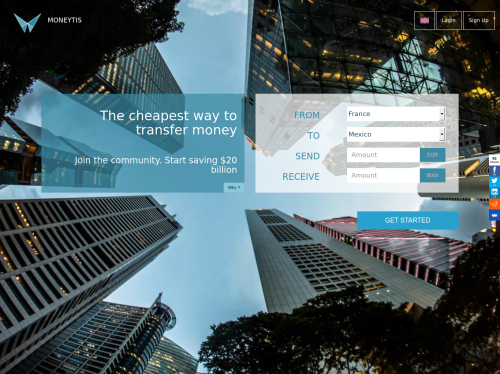 You are sure to use the cheapest money transfer solution, which has been verified, whatever the amount, (and) whatever the currencies (, and without leaving moneytis website). The partners we integrate into the platform are big money transmitters, but also P2P growing actors and Blockchain networks solutions allowing advantageous money transfers: Blockchain use makes transfers even cheaper. Using the blockchain technology is innovative, it allows security and instantaneity for almost no cost. To show an example of a current user, last week, Julien, French expat in Mexico, sent back a MXN amount worth 2’000 euros from Mexico for a cost of 1%. He received 80 euros more than usually with his bank and will save yearly 1’000 euros by using moneytis.